This week the Boston Symphony Orchestra, under Associate Conductor Ken-David Masur, joined forces with soprano Camilla Tilling, a well-chosen group of actors, and the Tanglewood Festival Chorus to present two contrasting sets of incidental music, Beethoven’s to Goethe’s Egmont, and Edvard Grieg’s to Ibsen’s Peer Gynt. (I attended on Saturday). While the former came as a relatively straightforward unstaged undertaking, the latter proved considerably more challenging. Peer Gynt began as a poem before being refashioned into a five-hour play. Even for performances, as billed here, of the “complete” incidental music, whittling it down to a reasonable one-hour length demanded hard choices. Guided by their musical and dramatic instincts, Masur and stage director/writer Bill Barclay followed the precedents of others who have highlighted more of the Peer Gynt music than the popular two concert suites. The Court Theater in Vienna commissioned Beethoven to write incidental music to Goethe’s historical tragedy Egmont in October 1809. Count Egmont was a well-known 16th-century martyr to tyranny and thus a most appealing figure to the composer. Conducting with economy of gesture and without a baton, Masur nonetheless used his whole body as appropriate with impressive results. The portentous opening of the overture contrasted satisfyingly with the tenderly expressive interludes of winds and strings. The hushed main theme built expectation which was fully rewarded by the noble, stirring forte reiteration. The chords of the massed horns were vigorous and martial. The coda’s sudden new major-key material surprised, as Beethoven intended. To the first song, “Roll the Drum”, Goethe gave patriotic, militaristic words, though Camilla Tilling’s performance as Klärchen, Egmont’s sweetheard, gave it an extra layer of complexity. While her singing was fully accented and energetic, as fit the text, her face initially conveyed apprehension as if she had some premonition of Egmont’s not returning from his military campaign. However, by the end when she wishes she could fight alongside him (“What joy without equal to be a man!”), all ambiguity was banished by her fervor. The four entr’actes each provide a transition of mood from the end of one act to its successor. The first, for example, began rather relaxed, but soon started to percolate with quietly buzzing passagework in broken thirds from the lower to the upper strings. The fourth and final entr’acte seemed to depict two moods at once—superficially serene and content but with an inner unease imparted by the lower strings’ murmuring chromatic neighbor notes. The miniature tone poem “Klärchen’s Death” was restrained but poignant. The Melodrama introduced actor Will Lyman to speak as Egmont, reflecting on his late Klärchen in a dream before awakening inspired to be a hero in his uncompromising battle with tyranny: “And to save all that is dearest to you, fall joyously, as I set you an example.” Lyman and Masur skillfully coordinated text and music here, which led naturally to the concluding “Victory Symphony” (Goethe’s term), sober at first but ending powerfully triumphant as Egmont goes to his execution confident that his example will play a role in the ultimate overthrow of oppression. Masur and the BSO are to be commended for introducing much of Peer Gynt that is unknown to most concertgoers who are generally only familiar with the two concert suites (i.e., the eight most popular selections). Part picaresque poem, part morality tale, Henrik Ibsen’s creation is cited by Steven Ledbetter as Freud’s favorite play: “a psychic battle between ego and id—before Freud had invented those terms—disguised as a folk tale.” This performance demonstrably achieved the objective of keeping the audience engaged throughout with excellent acting and first-class playing and singing though it made the, for me, unnecessary concessions of somewhat regular modernizations of staging and idiom, as well as occasionally promoting the drama to such a degree that the music, some of Grieg’s best, once or twice became a barely audible afterthought. The overture established the mercurial moods of the larger piece in short order with an explosion of high spirits alternating with the Nordic melancholy of Solveig’s Song. With the appearance of the solo Hardanger fiddle, played with rustic authenticity by Kathleen Parks, I felt virtually transported to 19th-century Norway. Will Lyman returned as the occasional narrator (aka the Button-Moulder), offering bits of the wisdom of experience (all spoken dialogue in English while solo and choral singing was in Dano-Norwegian, summarized in projected English surtitles). Our introduction to the character of Peer has him briefly fooling his widowed mother Åse who is torn between joy at his return home and yelling at him for telling tall tales. The actors, Caleb Mayo and Bobbie Steinbach respectively, skillfully evoked comical friction and touching devotion of their relationship. When Peer attends the wedding of Ingrid, a wealthy farmer’s daughter, whom Åse had earlier hoped he would marry, his mischief turns considerably darker: he seduces, abducts, and finally abandons the bride (movingly portrayed by Caroline Kinsolving). The next character to appear, the Woman in Green, played to the hilt by Georgia Lyman, made her entrance up the center aisle of Symphony Hall, flirting with several audience members. (One wonders what Ibsen would have made of this.) Soon enough, though, we learn she is a troll when she and Peer travel to the palace of her father, the Mountain King and leader of the trolls. Peer makes a hair-breadth escape, accompanied by the very famous “In the Hall of the Mountain King”, a piece used in films, commercials, video games, and adapted by jazz artists Duke Ellington and George Roberts as well as any number of rock bands. Still, there is nothing to compare with the original version, with the chorus impersonating bloodthirsty trolls, singing and shouting for Peer’s gruesome demise; the TFC (James Burton conductor), the BSO, and assembled actors generated much electricity here. Having barely gotten away, Peer finds himself confined for a time by an invisible entity, the Bøyg, which answers his questions enigmatically. The deep voice of Will Lyman, much amplified, moved unpredictably and unsettlingly around the auditorium via numerous speakers. 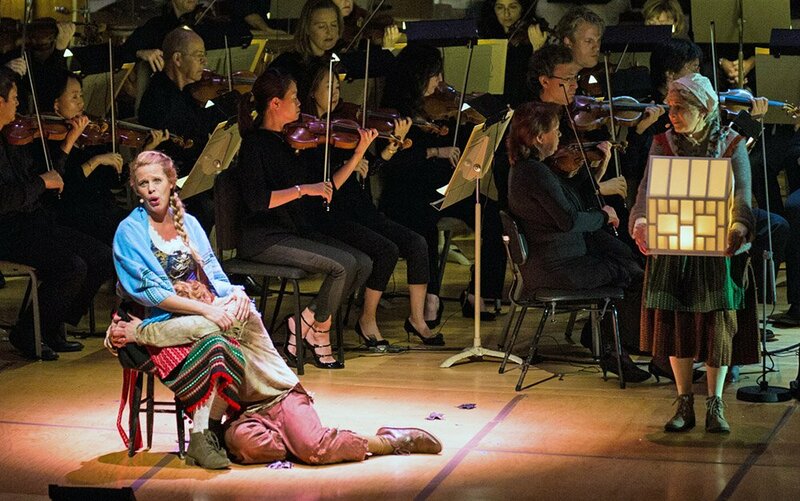 Act IV includes the drama’s most poignant scene, aptly accompanied by some of Grieg’s most heart-rending music: Peer returns home briefly to be with Åse as she lies dying. Steinbach and Mayo were again superb as mother and son while the orchestra’s strings were tender and darkly beautiful. We also hear Solveig’s Song in its entirety. Though many years since Ingrid’s wedding where they met, Solveig still carries a torch for Peer and expresses her love in this song. Camilla Tilling returned, her singing conveying her faith that Peer will return to her but also her inner uncertainty. After Åse’s death, Peer becomes a world-traveler though his egoism (self-interest as the chief guiding principle of his actions) remains constant: during a shipwreck off Morocco he survives by seizing the only life preserver available, leaving the crewmembers and his fellow tourists to drown. (While the latter part is also not authentic Ibsen material, it undeniably aligns with the rest of Peer’s history and character.) When he meets Anitra, daughter of a Bedouin chieftain, she turns the tables on him by pretending to believe his ruse of being a Muslim prophet while dancing her familiar dance for Peer to distract him as she robs him of his valuables. Masur and the BSO infused the dance with quasi-Arabic sensuosity and subtle desire, while Caroline Kinsolving, as Anitra, danced seductively but increasingly added a subtle note of comedy as she plucked gems and moneybags from an entranced Peer’s pockets. When she raps his knuckles and makes her escape on horseback, the spell is broken, but he still learns nothing. Peer soon ends up imprisoned in a Cairo madhouse (asylum is too benign a name for this place) with a dictatorial director, likely mad himself. Barclay transferred “Night Scene”—intended by Ibsen and Grieg for Peer’s final homecoming to Norway—to this Cairo locale. It makes an effective (if abbreviated from the original) musical and dramatic dialogue, with Peer’s speech alternating with the Tanglewood Festival Chorus. The TFC represent his sins of omission taking physical form to rebuke him, but he won’t even own his sins of commission (self-interest is the basis of his morality), much less sins of omission. Ultimately, Peer does return home, now an old man, to undergo interrogation by the Button-Moulder, perhaps a preview of Peer’s approaching interview with Saint Peter at the pearly gates. Peer’s apprehension is soothed by encountering the equally aged Solveig who still loves him and sings, in lullaby form, of her intentions to cradle and protect him, and thus redeems him. Tilling, bathed in a golden light (sunrise), sang this with caressing warmth while the BSO strings played with honeyed purity. If it was an unusually soft ending for a Boston Symphony concert, the emotional payoff was uncommonly deep and rewarding. 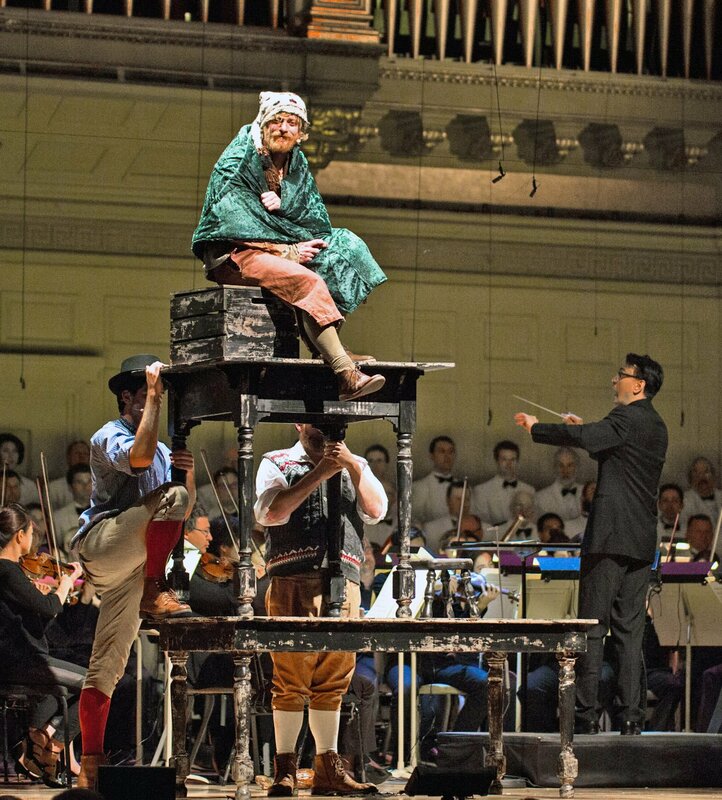 Though I still commend Ken-David Masur and the BSO for presenting much more of the Peer Gynt music and drama than most people know, I neglected to mention that in fact they are doing it for the current generation of Boston Symphony audiences. It was actually Kurt Masur, Ken-David’s father, who introduced an expanded, staged version of the work to BSO subscription audiences in January 1985. The TFC was thoroughly coached (re. diction) by native Norwegian speaker Olav Chris Henriksen, known to Boston audiences as a professional theorbo, lute(s), and guitar(s) recitalist. The Conductor of the TFC is James Burton. The text was a form of Norwegian Bokmål, incorporating a few other Scandinavian words and archaic spellings/pronunciations for regional/folk effect (as found in Ibsen’s text). Good review. What I missed! Will they do it again, as this is a chance to see how “incidental music” worked in the drama?